The women who have come to the WILPF conference in the Hague from Australia and Aotearoa- New Zealand, say that travelling with your feet on the ground, or at least with your wheels on the track, is the road to peace. The peace travellers from Australia and New Zealand are greeted at Budapest Keleti station.In April 1915, when more than a thousand women gathered for an international peace congress in The Hague, Netherlands, they made long and arduous journeys by land and sea. This week, precisely a hundred years later, we are assembling again in our hundreds here in this same city, marking the centenary of that event, which gave birth to WILPF, the Women’s International League for Peace and Freedom. And this time the great majority of us flew here, from all around the world, in a matter of hours. 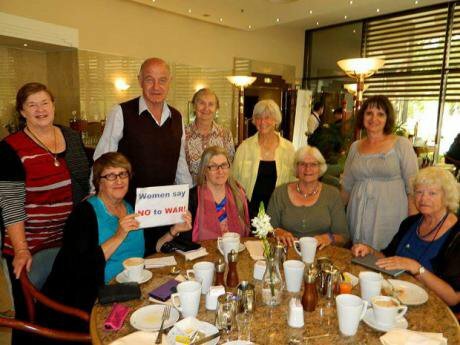 But… a handful of WILPF members from the most distant countries, eight from Australia and two from Aotearoa-New Zealand, decided to travel like their predecessors, by the slow, terrestrial route. They would take a train journey for peace. 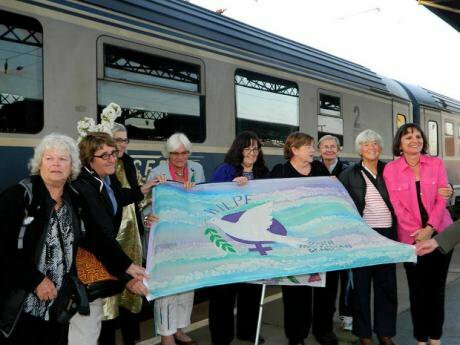 The idea was reminiscent of the women’s Peace Train that travelled from Helsinki to Beijing in 1995, carrying delegates to the United Nations 4th World Conference on Women. Indeed their original intention had been no less ambitious, involving women from Japan, the Philippines, India and Lebanon too, in a train trip that would have spanned Asia, the Middle East and Europe. Time and cost however scotched this plan, and the actual outcome was more modest: ten women departed from Istanbul, the city that marks the juncture between Asia and Europe, on 13 April and arrived in The Hague on 21 April. Listening to the travellers soon after their arrival, I began to understand that it was by no means just incidental that the motivation for the peace train came in part from Australia. Del Cuddihy told me, ‘It’s something we’ve learned from the indigenous peoples of Australia. They continually stress the importance of land, of connectedness to the land. We wanted to travel by train because we wanted to feel the land under our feet, to tread it. It’s only by walking on the others’ soil that you get to know them, have conversations, learn their culture’. 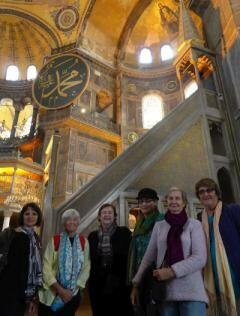 The travellers in Hagia Sofia Cathedral, Istanbul, where two world religions meet under one roof. The group stayed four days in Istanbul, and one of the stretches of land they trod was the beach at Gelibolu, the place where in April 1915 thousands of Australian soldiers landed on Turkish soil to meet their death in the debacle the world remembers now as ‘Gallipoli’. Several things during the women’s few days in Turkey caused the group to reflect on failures of communication. First, these soldiers had been mere lads from the other side of the world, ignorant and innocent, knowing nothing of the culture or terrain they were invading. And likewise the women travellers themselves felt, it has to be said, a little out of touch on arrival in Turkey, having failed to make connection in advance with local feminist antiwar organizations. The Turkish Government had apparently blanked out the WILPF International website and Facebook page in its censorship of Internet media. The women were also frustrated to learn that at the very start of their overland journey they were going to have to fly the first leg, for the railway line from Istanbul to Bucharest was under repair. That trusty communication technology of the 19th Century was letting them down in the 21st. Nonetheless, they reached Bucharest, then Budapest, getting a warm reception and welcoming events in both cities, before travelling on to Munich, Utrecht and eventually The Hague. And on the way they did indeed have several memorable conversations with individuals they encountered that served to ground them in the lands through which they were travelling. Breakfast in the hotel at Bucharest, Romania, joined by supportive fellow guests.Racist differentiation like this was a theme in another memorable conversation the travelling group had – this time with a man, a ticket inspector on the train as it passed through the Netherlands. He had seen the women to be a group, engaged with each other, clearly on some kind of project. He sat down to talk with them. They were as interested in him as he was in them. He told them that his family originated in Morocco, though he himself had been born in the Netherlands. He had received a higher education and aspired to be an accounts auditor, but said he found it difficult to get the professional work for which he was qualified. Was it, he wondered, because of his beard and dark skin? Talking among themselves, the women reflected on these stories they were hearing of negative stereotyping, how they gained authenticity from being told by the individuals experiencing it, from within their own cultures. Such encounters were confirming them in their conviction that travelling with your feet on the ground, or at least with your wheels on the track, is the road to peace. Del was continuing to reflect on the contrasted experiences they were having along the road of good communication and failures of communication. She had been reading a book, Great Information Disasters, edited by Forest Horton and Dennis Lewis, and in particular a chapter that told the story of the Yir Yoront, one of the Aboriginal tribes in Australia. In the first decade of the 20th century, these people were still using stone axes. These were more than tools to them, they were symbolic objects, their transfer from one person to another a complex means of communication. When white Australians introduced steel axes to the Yir Yoront, it rapidly destroyed their culture. This may well, Del said, recounting the story to me, not have been deliberate– merely a profound failure of understanding, of communication, predicated on a massive imbalance of power. The significance of Australia and Aotearoa-New Zealand as an origin of this peace train was becoming more clear to me. While there had been no Antipodean women at the first Hague Congress, by the Zurich Congress of 1919 there had been three. One was Eleanor Moore. Jane Addams, president of WILPF, had asked her at the time, ‘Do you feel it is worthwhile your travelling so far to this meeting?’ Moore had answered in the affirmative. But she had added that she was feeling a profound difference of perspective setting her apart from the European and North American women around her. Interestingly, seven years later, when WILPF first organized a Pan-Pacific Congress in Hawaii, sixteen Australian and New Zealand women had attended, Eleanor Moore among them. And here, Eleanor Moore remarked that the issues discussed were more regional, more local, more grounded. The alienating euro-centricity of 1919 was absent. Australia’s painful history, the despising and destruction of indigenous cultures by European colonizers, has generated a much needed debate about inter-regional cultural power relations. In her book Southern Theory, a forceful critique of academic imperialism, Australian sociologist Raewyn Connell writes, ‘The enormous spectrum of human history that the sociologists took as their domain was organised by a central idea: difference between the civilisation of the metropole and other cultures whose main feature was their primitiveness…. Within the colonised world, Australia had the distinction of being the most primitive of all, illustrating the extremity of degradation or backwardness.’ It was also no accident that one of the earliest critiques of the assumption of authority by Western feminists, One World Women’s Movement, was written by an Australian, academic and writer Chilla Bulbeck. At the WILPF Congress this week members will debate a Resolution to embrace leadership from the ‘Global South’. The text reads, ‘We can practice the fine art of learning from and being led by new ideas from cultural heritages, from acknowledging the leadership of our sisters from South and Central America, from Africa, from Asia, from the Middle East and from the Pacific’. As the League enters its second century there is a chance, then, that it may become the truly global and inclusive organization it has always aspired to be. Cynthia Cockburn is speaking at the WILPF centenary conference in the Hague April 22 - 29. Read read more articles in 50.50's series Women's Power to Stop War addressing feminist strategies to outlaw war and root out its causes. Marion Bowman and Jennifer Allsopp are reporting for openDemocracy 50.50.